Thank you, NFP! The U.S. released upbeat jobs data last Friday, allowing AUD/USD to move further south until the .7600 handle. This floor looks like a pretty strong one but I’m strongly bearish on this pair. Do you think I should book profits already or keep holding on? 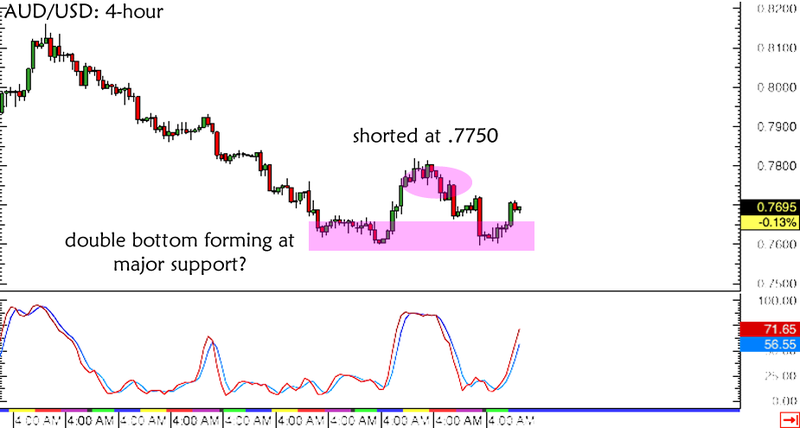 Before reading on, make sure you check out my initial forex trade idea! As I mentioned, I decided to short at market (.7750) instead of waiting for an actual test of the support turned resistance near the 50% Fib and .7850 mark. This turned out to be a good decision, as the pair eventually dropped like a rock after the release of bleak Chinese trade figures and strong U.S. jobs data. Since this one’s a swing trade setup, which is mostly based on diverging monetary policy biases between the Fed and the RBA, I’m planning on aiming for a much lower profit target around the .7200 handle. However, I’m a bit worried about this double bottom reversal pattern forming around the major support level… which has held since 2009! Then again, a strong downside break would mean that the pair is in for a longer-term decline so I’m going to be adding to my short position if that happens. Upcoming event risks this week include the U.S. retail sales release and the Australian jobs report on Wednesday so I’ll be ready to exit early in case those reports might lead to a pop higher. What do you guys think of my plan?